On a wet, gray night in early November, Charlo Torp, a former gambler who’s only recently kicked the habit, makes his way through the slush to Harriet Krohn’s apartment, flowers in hand. Certain that paying off his debt is the only path to starting a new life and winning his daughter’s forgiveness, Charlo plans to rob the wealthy old woman’s antique silver collection. What he doesn’t expect is for her to put up a fight. The following morning Harriet is found dead, her antique silver missing, and the only clue Inspector Sejer and his team find in the apartment is an abandoned bouquet. Charlo should feel relieved, but he’s heard of Sejer’s amazing record — the detective has solved every case he’s ever been assigned to. This novel is billed as belonging to Norwegian novelist Karin Fossum’s Inspector Sejer series. However, it is not a police procedural in the traditional sense since it’s told from the point of view of the murderer, with the impeccably persistent Sejer almost unseen and unheard until the closing chapters. When Phyllis King reviewed another Sejer novel (Bad Intentions) on this site, she described it as not a comfortable read, not a ‘cosy’, and noted that the police inspector played only a marginal role. Phyllis was new to Fossum’s writing and was not sure whether she wanted to read any more of it. 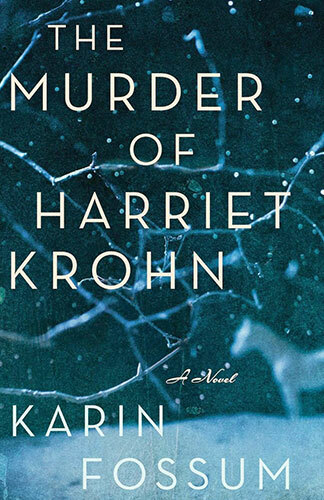 Similarly I was unfamiliar with Fossum when I read Harriet Krohn and while I can recommend the novel as well written and insightful I’m not eager to chase up another Fossum title right away. This is such a sad story, I thought as I read. Pathos is the keynote. Other readers’ reactions will differ, of course. Charlo, the killer and thief, may anger and exasperate you: why is he so ‘whiny’ and self-excusing? If you’ve read Dostoevsky’s Crime and Punishment, your reactions to that novel’s killer protagonist, Raskolnikov, will probably be a guide to how you’ll respond to Fossum’s Charlo. For Fossum has clearly set herself the task of writing a modern version of the Dostoevsky classic, albeit choosing to produce a briefer text with fewer characters and heightened incidents. As a former student Raskolnikov has the intelligence and vocabulary to surround his plans and actions with high-faluting justifications: some men have a right to kill, he could be serving a higher purpose, he is freeing the world of an unscrupulous money lender, and he can counter-balance the killing with a good deed funded out of the theft proceeds. Fossum’s poorly educated and quite modest Charlo cannot articulate equivalent rationalisations. He functions more on an emotional level as he seeks to use some of his illicitly obtained funds to re-instate himself in the affections of his teenage daughter, Julie, by buying her a magnificent dressage horse. So Fossum’s narrative is more of a psychological study than an overt contemplation of moral questions, although on occasion Charlo’s speculations take on cosmic dimensions. A wait in his local Job Centre with men who are unemployed and disheartened prompts him to think that he’d prefer to “be part of society” and to “do things right”. But maybe it was the case that when he committed the murder he was assuming “a role that was intended for him”? Can he atone for his misdemeanour by behaving well for the rest of his life? Not as regards the justice system, but in terms of the great, eternal reckoning? If there is such a thing. She [Julie] doesn’t know that I’ve finally done something for her, for us. She doesn’t know what I went through for her, and for our future. He paces from room to room waiting, chain-smoking, nervous and jittery. Outside, the sunshine is hazy, and when at last he goes to his car, he treads on frozen leaves, they crunch loudly in the silence. Everything is so bright and sharp and cold. He’s becoming reacquainted with himself. After feeling like a stranger in front of the mirror for so long he feels more relaxed. It’s taken time, but time has come to his aid in the form of the rising hope that perhaps he’ll get away with it. Some people do escape. After Charlo suffers several falls and feels weakness in his joints, he is forced to consider whether he is losing his previously excellent physical health, and if so why. Could illness be a punishment? With this plot complication Fossum introduces some suspense into a narrative that otherwise seems to have a foregone conclusion, the catching of the waiting crook by Inspector Sejer.